Hajj is a very emotional season for me. As I see pictures of thousands of people circulating the Kabah, and read messages from friends and family happily announcing that they’ve gone for Hajj, I can’t help a tear from rolling down my cheek. It may seem incredibly unfair, not just to me, but to everyone who hasn’t been on this once-in-a-lifetime pilgrimage. What can I do, as I continue my regular, everyday life? There’s no need to despair. This beautiful Deen has left no stones unturned when it comes to earning rewards. As my heart mourned over not being able to perform Hajj, I promised myself to not leave myself deprived in these prized ten days. My Rab, the Most Merciful, the Best of Planners has left countless opportunities to make the best of this season. Why waste that being sad? So, here are some unexpected ways of doing good for those of you not going for Hajj. Understand and accept the decree of Allah. Know that whatever happens has been written by Allah, and know that nothing comes from Allah except good. If you’re not going for Hajj this year, have faith that the future holds something better for you. Make dua every chance you get. Beg and plead Allah to call you to His house next year. Pray between the athan and iqamah, beseech Allah in sujood, stand in the last third of the night … leave no chance to ask Allah to bless you with an opportunity to do Hajj. One of the lesser known benefits of doing thikr is that it keeps your mind away from sad, harmful thoughts, because your tongue is so involved in remembering Allah! In these blessed days, spend your free moments praising and glorifying Allah, and if you still need some inspiration, here is the recommended thikr for this time of the year. I play this on my phone, and it really makes this amazing season feel so special and festive. Educate yourself about these ten days. Find books to read, watch lectures on YouTube, read blog posts about it … take the time and comfort you have and invest it in something valuable. May I recommend this as a starting point? As the Hijri year comes to an end, try your best to end it on a good note. Apologise to the people you’ve wronged throughout the year, be extra kind to your parents, send food to your neighbour, call a friend … Let this month be a way of turning to a fresh page, and a clean start to the new year. I don’t know about you, but since Ramadan I’ve slacked in terms of praying and reading Quran and all forms of worship. For me, and for you, this is a valuable ‘boost’ to help us get back on track again when it comes to our relationships with Allah. Observe and learn form the rituals of Hajj. Thank Allah for allowing you to witness another year. We’ve lived through an entire 12 months since the last Thul Hijjah, and it’s all thanks to nothing but the love and mercy of the Most Loving and the Most Merciful. So what if we weren’t able to perform Hajj? The Lord deserves praise through every moment of every day and through every second of every night. We have countless incredible blessings to be grateful for. These are just some of my humble suggestions and observations, I sincerely pray that you find some hope and benefit in them, and I pray that Allah allows all of us to perform Hajj at least once in our lifetimes. What makes Islam so incredible is that fact that it isn’t simply a set of rules to follow or beliefs to adopt; it’s a compete way of life. Our Messenger صلى الله عليه وسلمtaught us everything, from how to mourn the loss of a loved one to what day to trim our nails on. So, it make perfect sense that we’ve also been taught the ettiquettes of celebration. And what better occasion to celebrate than Eid, a day which marks the end of a season of obedience, praise and glorification … all for Allah. From Allah’s countless creation He has given preference and significance to some creations over others. Good deeds done in certain months and days are more sacred and beloved in the sight of Allah than others. Out of these significant days we are coming near to one of the greatest days of the year, the day of Arafah, 9th Dul Hijjah. What makes it so significant? * Our religion was completed. * It is the main day for those performing Hajj, a Hajj cannot be completed without observing the Day of Arafah. * Its a day of forgiveness and the day Allah frees His slaves from hellfire. * Its one of the days from the Sacred months and also from the first 10 days of Dul Hijjah, in which the deeds are most beloved to Allah. 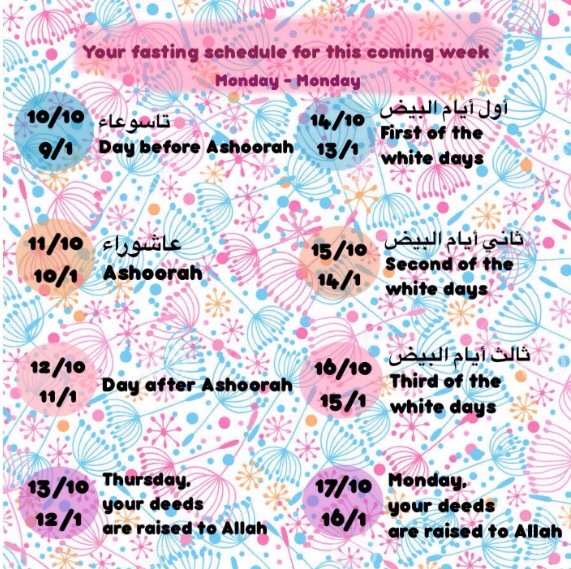 How to observe the Day of Arafah? * Increase in takbeer and tahleel. May Allah swt accept our good deeds and forgive all our sins. People gather together for many reasons, be it political or religious. Gatherings help show solidarity and power of a particular group of people or school of thought. This reminds me of some large gatherings round the world like the Maha Kumbh Mela which takes place every 12 years. It is probably the world’s largest gathering ever. The 55-day gathering draws millions of people at the mythical rivers of Ganges and Saraswati to be cleansed of sins and seek salvation.